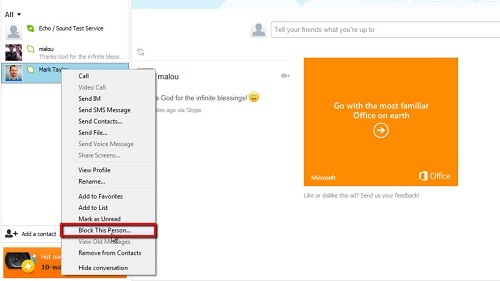 In this tutorial you are going to learn how to report Skype spam. 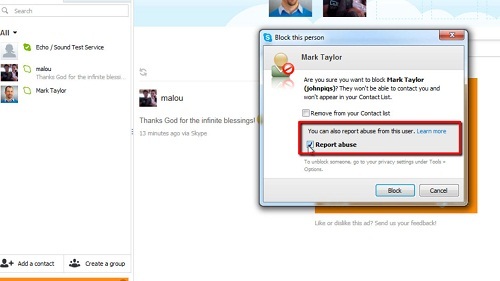 You can choose to block a contact, preventing them from contacting you in the future, or report the contact to Skype if you believe they have violated Skype’s terms of service. From the default home page view, select the “Contacts” tab or the “Recent” tab, both found just below the search bar, underneath the “home” icon. Right-click the contact you wish to report for spam, and select “Block This Person…” from the contextual menu that pops up. A new message box will appear that allows you to either remove the contact from your contact list or Report Abuse from this user. Tick the box that says “Report Abuse” to notify Skpe of nuisance contacts. We won’t complete this process in this example as this user is not actually responsible for any spam. This is, however, the simple process for learning how to report Skype spam.